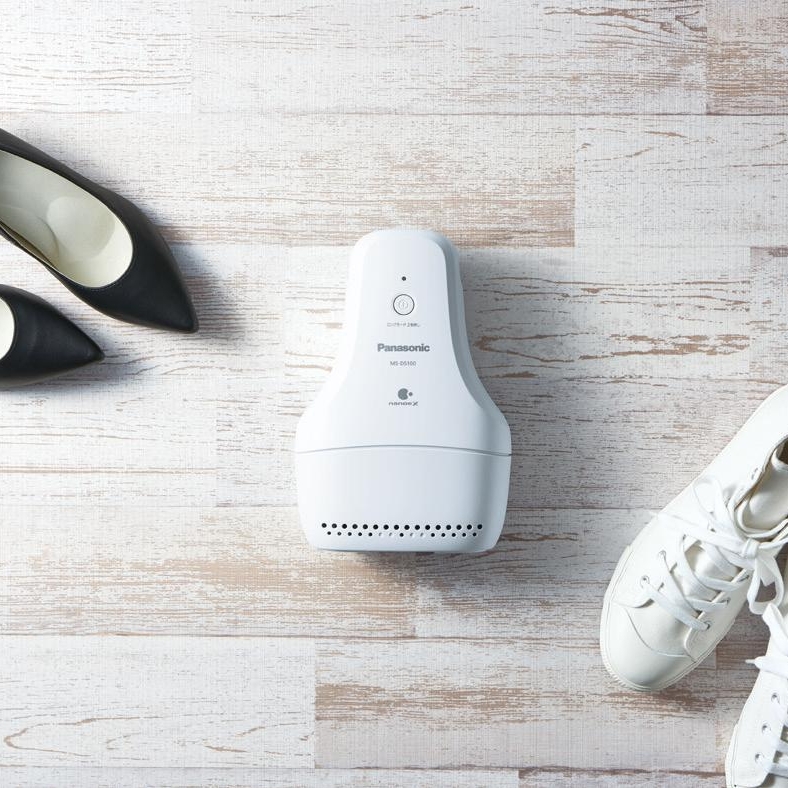 Panasonic Corporation will begin selling a shoe deodorizer, the MS-DS100, equipped with “nanoe X” that generates 10 times(*2) more hydroxyl (OH) radicals than “nanoe” to remove unpleasant shoe odors in a simple way, on September 20, 2018 (in Japan only). The MS-DS100 utilizes Panasonic’s original ion particles, “nanoe X,” to dissolve and eliminate unpleasant shoe odors(*1). When the product is set in shoes and the switch turned on, “nanoe X” is generated and spreads from six outlets to every corner of the shoes to remove odors(*1) in the entire interior of the shoes from the heel to the toe. The MS-DS100 utilizes Panasonic’s original nano-sized ions, “nanoe X.” Measuring about 5 to 20 nm each, the “nanoe X” particles penetrate the textile and dissolve and eliminate unpleasant shoe odors(*1).The six outlets discharge and spread “nanoe X” to every corner of the shoes to provide a thorough deodorizing effect. *1: Effect of deodorizing foot odors (isovaleric acid) adhered to shoes. Testing laboratory: Panasonic Corporation, Product Analysis Center. Testing method: 6-stage odor intensity measurement method in an about 10-m2 test room. Deodorizing method: Generation of “nanoe.” Test result: Odor intensity decreased by 1.5 in 5 hours. Test result certificate issuing date: June 4, 2018. Test result certificate number: 1V332-180604-K01. – Test results were not obtained under actual use conditions. – Deodorizing effect varies depending on the ambient conditions (temperature, humidity), operating time, type of odor, and type of textile. – Sensitivity to the deodorizing effect may vary from individual to individual. *2: According to the results of Panasonic’s measurement conducted based on the ESR method. Comparison between 480 billion “nanoe” particles/second and 4,800 billion “nanoe X” particles/second. – Mobile battery is not supplied with the product. This entry was posted in Uncategorized and tagged 360, 360 Magazine, Antibacterial, Atrin Yazdani-Biuki, brand, Deodorize, Deodorizing, design, environment, foot odors, hygienically, Internet, Japan, Japan Food Research Laboratories, laboratory, Mobile battery, nanoe X, odors, Panasonic, Panasonic Corporation, product, resin, shoe, shoes, Storage, stylish, survey, Vaughn Lowery on August 9, 2018 by wp360mag. 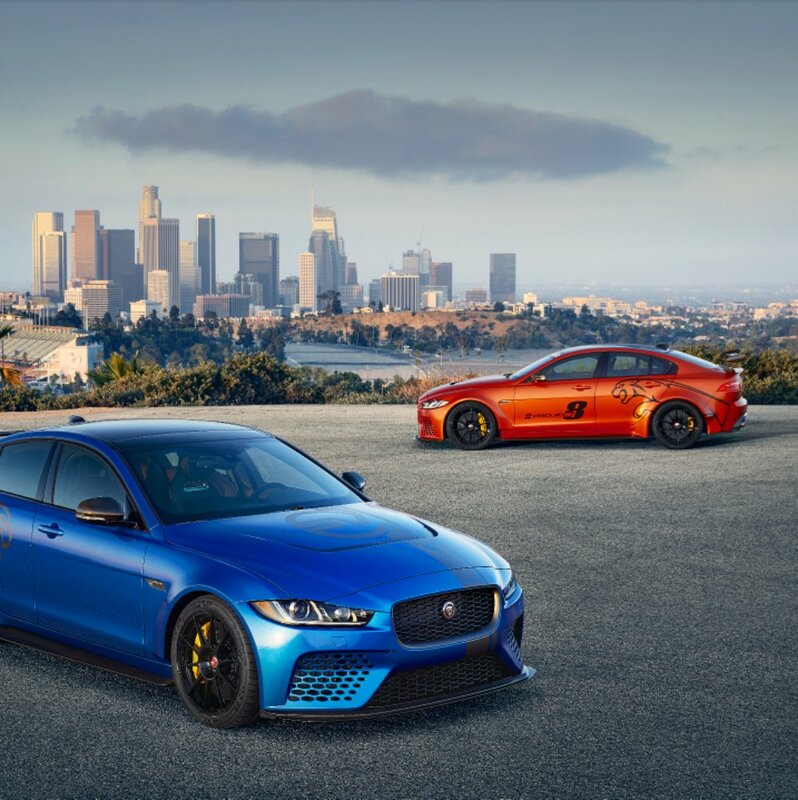 Fresh from its world debut at the Goodwood Festival of Speed in June, Jaguar Land Rover Special Vehicle Operations (SVO) will introduce its latest high performance creation, the Jaguar XE SV Project 8, to North American automotive enthusiasts during this year’s Monterey Car Week. Located along the start/finish straight in the race paddock, the four Jaguar Land Rover pit lane garages play host to a celebration of the brand’s latest vehicles. The Jaguar Land Rover pit garages will present race fans a special exhibit, “the House of SVO,” showcasing the engineering and design capabilities of SVO in creating high-performance versions of the brand’s most popular cars. Visitors to the space can see the all-terrain Range Rover Sport SVR performance SUV and Jaguar’s all-weather supercar, the 200mph F-TYPE SVR Coupe2. 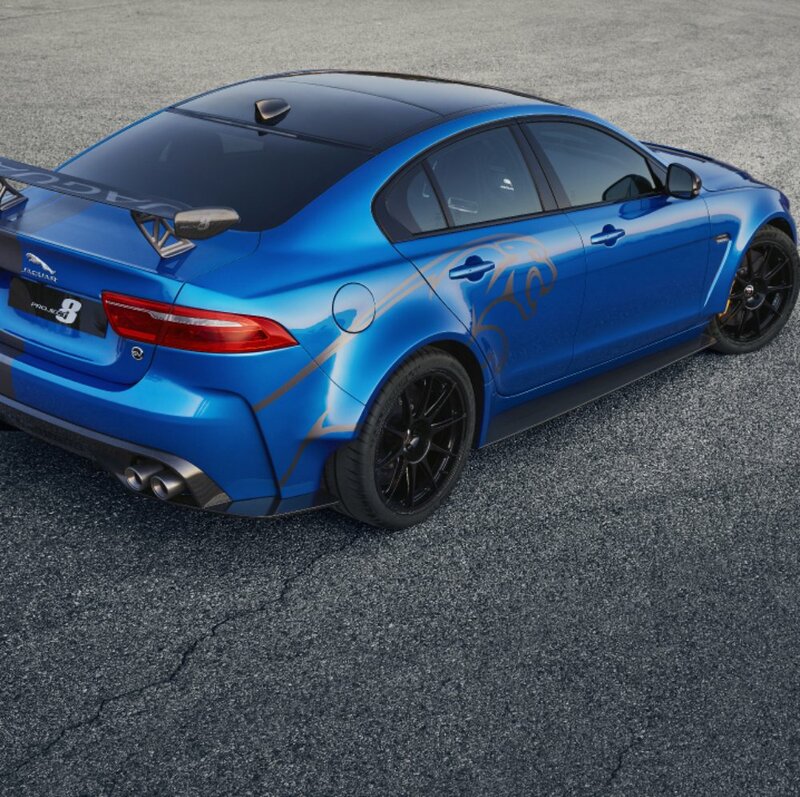 The centerpiece of the display will be the Jaguar XE SV Project 8, where prospective clients can be among first to register their interest for the limited edition model. Guests to the garages also have the opportunity to try their hand behind the wheel of a Panasonic Jaguar Racing Formula E race car; piloting the vehicle as part of an immersive virtual reality experience housed within the Jaguar display space. Nestled between turns three and four of Mazda Raceway Laguna Seca, fans can explore the off-road limits of their favorite British SUV brand behind the wheel of several different Land Rover vehicles, including the all-new fifth-generation Land Rover Discovery. Visitors will climb and descend steep hills, drive off-camber turns and over obstacles, sampling the latest driver’s assistance aids which help make easy work of even the toughest trails3. Fresh from its debut at the New York International Auto Show, Land Rover will also have the fourth member of the Range Rover family – the all-new Range Rover Velar – on display, sharing space with the brand’s halo vehicle from SVO, the $200,000 ultra-luxury Range Rover SVAutobiography Long Wheelbase1. The Monterey Motorsports Reunion at Mazda Raceway Laguna Seca runs from Thursday, August 17, through Sunday, August 20; please visitwww.MazdaRaceway.com for full event scheduling. In addition to the Rolex Monterey Motorsports Reunion, the XE SV Project 8 will also be shown on Friday, August 18, at The Quail, A Motorsports Gathering. Flanked by SVO’s first-ever series production Jaguar, the 575hp F-TYPE SVR, the limited-production XE SV Project 8 will join more than 200 other rare automobiles and motorcycles in an exclusive garden-party setting on the rolling greens of Quail Lodge & Golf Club from 10:00AM – 4:00PM. Later in the day, Special Vehicle Operations will show the 2018 Jaguar XE SV Project 8 at Exotics on Cannery Row. As one of the few non-ticketed public events during Monterey Car Week, Exotics on Cannery Row showcases some of the rarest and most exciting supercars of our time against the backdrop of Monterey’s historic downtown. The event is free and open to the public, running from 3:00 – 8:00PM. Born from SVO’s desire to engineer the ultimate super sports sedan, the XE SV Project 8 builds on the success of the 2016 F-TYPE Project 7 as the brand’s second Collector’s Series vehicle; redefining the capabilities of how a four-door Jaguar can perform on track. With the project currently under development, engineers are targeting a power output of 592hp; enough to make this the quickest road going Jaguar ever and capable of speeds up to 200 mph2. Along with the dramatic increase in power, a number of functional aerodynamic, suspension and interior enhancements to the XE help make this car the brand’s most powerful, agile and extreme performance vehicle ever4. Global production for the XE SV Project 8 will be limited to just 300 units, each hand assembled at the SVO technical center in Coventry, England. Senior representatives from SVO will be on hand at events throughout the weekend to answer questions and help potential buyers register their interest. Those not attending can visitwww.JaguarUSA.com to keep up to date and register their interest. 2 Always follow local speed limits. 4 All illustrations, photographs and specifications shown here are based on the Jaguar XE SV Project 8 prototype vehicle. Final U.S. specifications, design, equipment, and accessories have not been determined. Therefore, U.S. production vehicles will differ from the one shown. Jaguar is a premier manufacturer of luxury sedans, sports cars and SUVs offering unparalleled design with tremendous performance. The company’s vision throughout its storied 80 year history has been simple: To produce beautiful, fast cars that are desired the world over. Jaguar strives to provide a world class ownership experience to every owner. Today’s Jaguar lineup consists of the Jaguar XE and XF sports sedans, the XJ full-size luxury sedan, the two-seat F-TYPE sports car and a line of performance SUVs, the E-PACE and F-PACE. Jaguar designs, engineers and manufactures exclusively in the United Kingdom, at the Castle Bromwich and Solihull manufacturing plants in the British Midlands. Jaguar is fully engaged with sustainability initiatives and social concerns with continuous involvement in environmental and community programs. For more information, visit the official Jaguar website at www.jaguarusa.com. This entry was posted in Auto and tagged 360 Magazine, 600hp, auto, cannery row, car, exotics, formula e racing car, jaguar, john Edwards, Laguna seca, land rover, mazda raceway, Monterey, motorsports, muscle cars, Panasonic, pebble beach, pop culture, project 8, sedan, special vehicle operations, supercars, supercharged, sv, svo, the quail, Vaughn Lowery, xe, xe sv project 8 on August 10, 2017 by wp360mag. Jaguar Land Rover and Gorillaz are working together to recruit the next generation of world-class electronics and software engineering talent with a code-breaking challenge found in the virtual band’s app (watch vid). The best performers within the app will be fast-tracked through the recruitment process, helping to meet the Jaguar Land Rover brand’s goal of employing thousands of bright new talents over the next year. It is a major change in the way the business looks for candidates, aiming to tackle the engineering skills gap, and inspire and attract a diverse range of talent and new thinking. Interested applicants can download the Gorillaz App now at the iTunes App Store® (https://itunes.apple.com/us/app/gorillaz/id1217997478?mt=8) or Google Play™ (https://play.google.com/store/apps/details?id=com.Parlophone.Gorillaz&hl=en). To find out more about Jaguar Land Rover recruitment, visit www.jaguarlandrovercareers.com. For more information on specific roles in Electrification, visit www.jaguarlandrovercareers.com/jlr-roles/product-creation/electrification/. The Gorillaz App today launches a new Jaguar Land Rover recruitment area in the form of a 360-degree environment situated in the garage of the band’s home, which also features all the iconic vehicles from the Gorillaz past. Here, applicants can explore and take a two-part challenge. The first part, designed to educate users about the benefits of electric vehicles, involves assembling the Jaguar I-PACE Concept1, the first all-electric Jaguar five-seater sports car. Users can learn about the vehicle’s performance, battery technology, space, charging and range. The second and more demanding part of the game, developed to engage and recruit budding electronic wizards and coders, will focus on cracking code will focus on cracking code in Alternate Reality Game format (ARG). The challenge takes them on a series of code breaking puzzles that will test their curiosity, persistence, lateral thinking and problem solving skills – all real world attributes of a new generation of software and engineering talent. “This exciting collaboration between Gorillaz and Jaguar Land Rover adds an Alternative Reality Game layer to what is already a cutting edge mixed reality mobile experience combining AR, VR and 360,” said Davor Kravac, Executive Creative Director at B-Reel London. The Jaguar I-TYPE, Panasonic Jaguar Racing’s all-electric Formula E racecar, appears in the garage. Users can click on a poster of Noodle with the I-TYPE and “FanBoost” which enables them to vote for the @JaguarRacing team drivers to gain a power boost during their next race or to follow the @JaguarRacing Twitter channel. 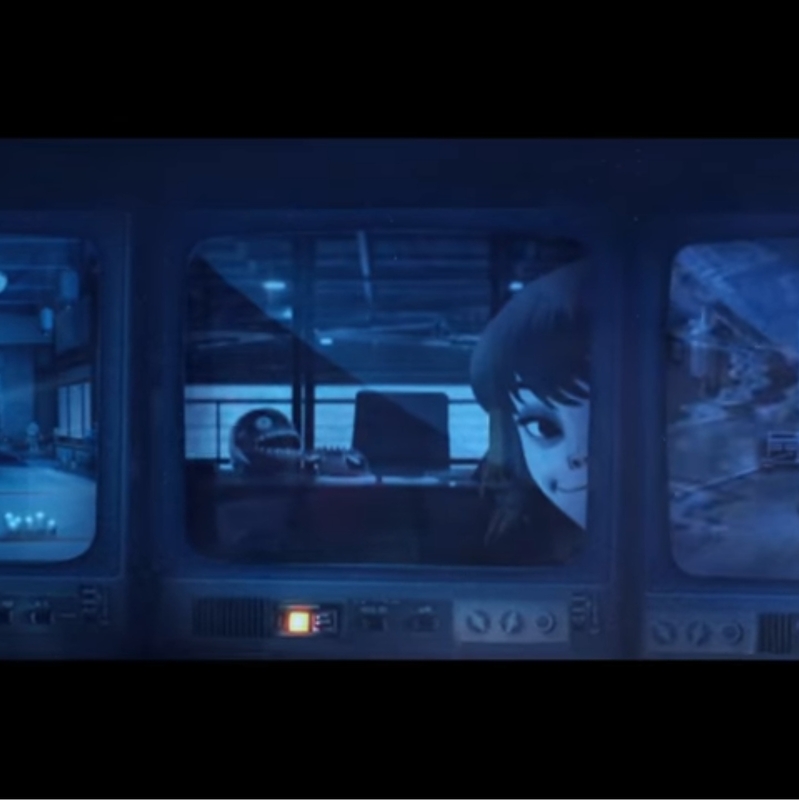 The project follows the Jaguar Land Rover STEM initiative with Gorillaz in 2016, where founding member and female guitarist, Noodle, became the Jaguar Formula E Racing Ambassador. As the UK’s leading investor in research and development, and a leading global automotive manufacturer, Jaguar Land Rover is putting Noodle at the forefront of its campaign to address the skills gap that manufacturing is facing worldwide. 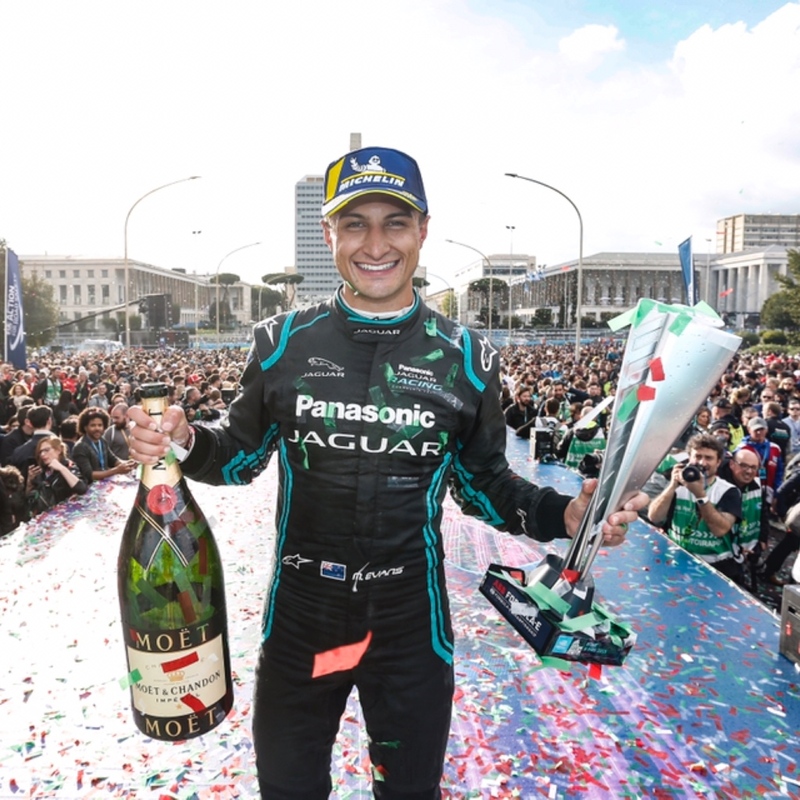 The company has used its debut season in Formula E to promote the Jaguar Land Rover brand’s thought-leadership position as a business that is shaping the future to solve the technology innovation and skills gap challenges. Traditional application methods remain open and resumes will be accepted, but Jaguar Land Rover invites potential applicants to download the app, break the codes and solve the problems to fast-track their way into employment. (1) All illustrations, photographs and specifications shown here are based on the Jaguar I-PACE concept vehicle. Final U.S. specifications, design, equipment, and accessories have not been determined. Therefore, U.S. production vehicles will differ from the one shown. This entry was posted in Auto and tagged 360 Magazine, app, Apple, auto, band, British, car, consumer, design, digital, EDM, europe, f-pace, F-Type, Google play, gorillaz, I-pace, iTunes, jaguar, land rover, London, music, Panasonic, range rover, recruitment, search, tech, UK, Vaughn Lowery on June 19, 2017 by wp360mag.